Ethiopia got some mainstream international airtime last night as the producing team at American primetime television king CNN’s “Anthony Bourdain: Parts Unknown,” decided to dedicate an entire episode to Ethiopia, and more specifically the unique, exquisite traditional delicacies of the land. The spicy, colourful, mouth watering array of vegetarian and meat dishes eaten with the national flatbread injera, have long since rendered Ethiopian cuisine a marketable internationally recognized brand. 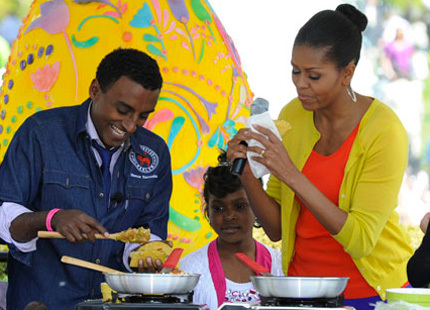 Anthony was accompanied by the Ethiopian power couple of celebrity chef Marcus Samuelsson and his beautiful model wife Maya Haile. For Ethiopian viewers at home and abroad, the program had us immersed in anticipation. Ethiopians are extremely attached to all that is part and parcel of the Ethiopian identity, and the cultural aspects including food are crucial in this aspect. 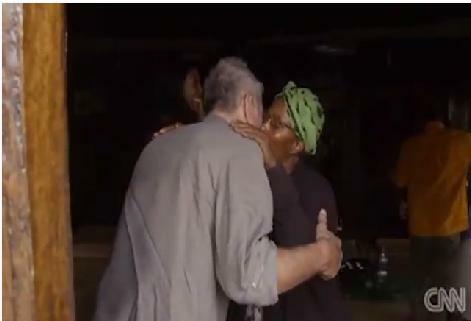 And the news that a critically acclaimed and renowned television personality like Anthony Bourdain would be in town, getting a look for himself at everything Ethiopians hold so near and dear to themselves, meant that Maya and Marcus, unbeknownst to them, were given a sacred national duty to protect the nation’s image. Despite the Harlem based couple returning to their native Ethiopia for what was probably a long sought after vacation, a nation counted on them to reintroduce Ethiopia in a whole new light to the world, via CNN, a network whose traditional coverage of Ethiopia has its viewers accustomed to seeing only the most disparaging and depressing that humanity has to offer come out of the ancient East African nation. Anthony scouted Ethiopia as a target destination due to the good reputation of the food available and he wouldn’t be disappointed. Gurage cultural dishes have always been the rage in Ethiopia, even if the likes of “kitfo” are becoming harder to afford by the average Ethiopian. The rising prices of butter and meat, have failed to show any signs of mercy for a population which had been absolutely gobsmacked by a sudden steep skyrocketing of inflation around the late 2000s. But Anthony enjoyed every sweet, succulent serving of original Ethiopian food straight from the natural habitat it hails from. Anthony, who gets his kicks from partaking in the exotic, has surely left Ethiopia reinvigorated like never before. The general consensus among Ethiopians is that the episode was an absolutely refreshing break from what the CNN network normally broadcasts out of Ethiopia. From the feedback viewable on Anthony Bourdain’s official Facebook page, it is clear that most were amused by his antics and delighted with the portrayal of their country as a destination for your food loving flair seeking globetrotter. But as is the case, it’s impossible to please everyone and Anthony’s stint in Ethiopia has won him his fair share of Ethiopian detractors. Among some of the flaws critics are pointing out is that enough of Ethiopia’s cultural heritage and beauty wasn’t on show for the international audience. The blame for this is placed squarely on Marcus and Maya, for not having given Anthony the grand tour of the likes of Lalibela, the sight of some of the most astonishing mesmerizing rock constructed churches in the world. They were mentioned briefly by Anthony at the beginning of the show, but he didn’t end up traveling there. Addis Ababa’s construction boom was shown fleetingly, but for the most part the trio remained in the countryside, away from the bustling cities. The fact that these and other eye catchers weren’t the main focus of the show has some viewers accusing Maya and Marcus of committing a blunder and missing a golden opportunity to shine a giant fluorescent spotlight over their country for the world to gaze at. But these critics must not be familiar with the “Anthony Bourdain: Parts Unknown” show format. As the title specifies, the program is about touring different regions of the world and promoting the parts unknown to the masses who otherwise might feel they have seen all there is to see in the area in question. Why would we just take Anthony on a Selam Magazine photo shoot when there is so much more untamed beauty in this country that isn’t necessarily charted by the UNESCO foundation? Like it or not, what we saw on CNN yesterday was an accurate depiction of what Ethiopian society is like. The gatherings, the social life, the family bonding, the loving atmosphere, the farming life, the slaughter of animals, Anthony wouldn’t necessarily experience this at a luxury restaurant in an upscale district of Addis Ababa. The glitzy glamorous buildings of the economic boom aren’t part of the Ethiopia that has been around for millennia. The straw huts are, and if the loving, welcoming, warm reception and ceremonial salted coffee Anthony was treated to in the Gurage plains is something you wouldn’t want the world to see, then perhaps you need to look at yourself in the mirror and realize that you have become too egotistic. The majority of our population still plows the soil for a living and there’s no shame in that. In fact, the fact that Ethiopians who are firmly rooted to living this hardworking backbreaking lifestyle find the time to congregate among families, neighbours and villagers in commemoration of national or religious celebrations, ensuring they live an enrichened social life among large communities without skipping a beat, is something that the bustling busy inhabitants of western societies can learn from. The other reason that a fraction of Ethiopian viewers are up in arms over the show is the entire idea itself. Some Ethiopians opposed to the rule of the current government in Addis are voicing their displeasure at the CNN allowing Anthony Bourdain to go ahead with his lighthearted coverage of Ethiopian cuisine in a country where human rights abuses are rampant. There’s no denying that there are endless echoes of agonising cries originating from Ethiopia over a host of well documented government failures, be it human rights abuses, a lack of free speech or independent media and more. However Anthony Bourdain isn’t a political activist or an oppressed people’s knight in shining armour. He didn’t make the overseas trip in search of democracy, it just isn’t his thing. The reoccurring themes of episodes of Anthony Bourdain: Parts Unknown, is food and culture. It’s his right to do whatever he wants in the country and as a tourist who is paid to explore the mesmerizing, the eye opening, the mouth watering and the jaw dropping of whatever corner of the earth he’s on, he simply did his job and documented his exploits for the viewer to enjoy. He would have a lot less viewers if his job was to hunt for violations of basic freedoms. He would have a lot less ratings too, because it simply wouldn’t be the Anthony Bourdain that the world has grown and love. The trump card argument is that the CNN should be busier covering the drought in Ethiopia and not cater to the needs of the folks at the Ethiopian Ministry of Tourism, who were most probably left smiling with glee after yesterday’s broadcast, thinking of the inevitable flock of lotion soaked backpacking tourists sure to soon clamour up Bole International Airport asking anyone around if they know of a Mrs. Bizunesh or for the fastest hiking route from the airport to the Gurage zone. But if anyone believes that CNN is the holder of a moral compass for which to pass judgment upon the peoples of the world, they need to get themselves checked. CNN is not a human rights organisation. CNN serves the interests of paying stakeholders and may or may not care about the plight of a certain people. They are by no means bound to reporting on what else is happening on the ground in Ethiopia. Indeed they are known for turning a blind eye to the most macabre of happenings and over magnifying comparatively insignificant instances in the interest of furthering political goals. It’s a whole other topic that I won’t need to go into here, but holding CNN accountable for their failure to report a story shows naivety if not anything else. For Ethiopians who insist that international media news reports, analysis and documentaries from the country must be limited to the gloomy and the bleak, I suggest heading to your nearest public library and going through the hours and hours of endless archive footage of such reporting. Is it a sin for someone to wish for the lens to zoom in on the silver lining once in a while? Lighten up! Stop seeing everything positive from the country as catalyst to the EPRDF strengthening its stronghold on power. I wonder if these people understand the damaging long term effects of the media’s tarring of Ethiopia’s image on second and third generation Ethiopians. For the most part, children and young adults, many have been brought up in the nineties feeling ashamed of their Ethiopian roots due to a portrayal of their country as a warring, famine struck hellhole. A lack of balanced reporting will only lead the coming generation of Ethiopians astray. If we want the mostly computer savvy, resourceful generation of foreign born Ethiopians to one day come back and contribute to bringing the necessary changes and aiding in our national aspirations, we need them to know there is a land, a people worth going back for. Growing up and hearing at school and on TV that there is no hope whatsoever for saving their ancestral land from chronic droughts and political strife will simply see more of these young Ethiopians shun their identity and show no interest in learning the language or getting intertwined with the culture despite the best efforts of their overzealous parents. In this sense, seeing an Ethiopian adoptee (Marcus) and Maya, his wife who grew up in Europe, become virtual tour guides in a country they had once grown distant from, must be a source of hope for millions of Ethiopian immigrants who have bore children abroad. 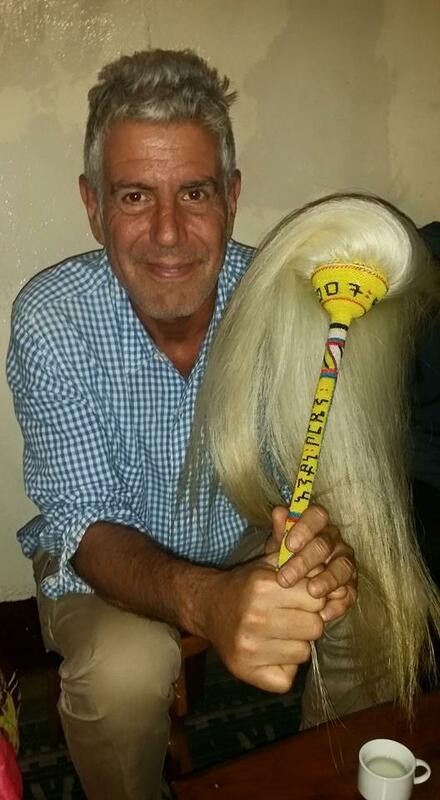 Thus concludes my review on Anthony Bourdain’s brief but endearing and most certainly unforgettable experience in Ethiopia, as well as the few murmurs of discontent surrounding it. As Anthony said, Ethiopia is indeed a “misunderstood” country. But to all who seek to discover the hidden beauty that is Ethiopia, Anthony has made is clear that understanding Ethiopia takes nothing but pure intentions, a curious mind, and a big appetite! Previous Post IRREECHAAGATE: ZONE 9 BLOGGERS “GUILTY” THIS TIME? !